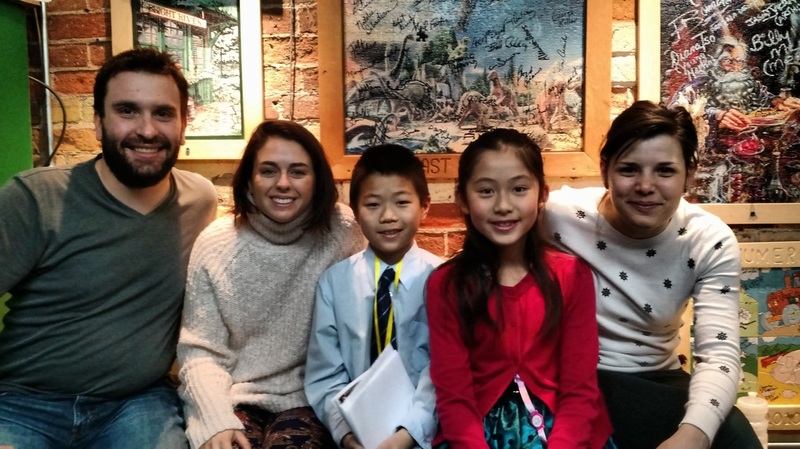 During the March break, Young People’s Theatre (YPT) was thrilled to welcome the Quebec theatre company Tout a Trac and their breath taking production of Pinocchio. Hugo Belanger whipped up a play with dance, puppetry, music, and illusion at a hair rising speed. It was a live, emotional, and just as imaginative as Geppeto himself, the kind old wood carver. The seats were almost full when the play started. We found a cottage right in front of us. It looked rather small, and had a broken window, a table, some wooden toys, and a log. The lights went dim; the lights only appeared on the broken glass window. The show had started and someone came out the back of the cottage. I had expected the play to start with someone carving out Pinocchio. But instead, Geppeto, the father of Pinocchio, came in with a loud, hilarious jump-in that brought shock waves of laughter through the audience. Gepetto ran from the back of the cottage, looking very confused. He was cold and poor. He tried to burn a log for warmth, but the log started fighting back, shouting: “I WANT TO BE A BOY, I WANT TO BE LIKE YOU, LIKE EVERYONE! I’M NOT GOING TO REPEAT MYSELF!” and the log soon became the wooden marionette – full of happiness and energy. Geppeto sent Pinocchio, who promised to work hard and bring riches into the family, to school. On the way, though, he encountered a fox and cat. The spotlights of the show were them, for they were a stunning pair that told lies that could build a stair case to the moon. They led Pinocchio out of school, and into a life of lies. With the assistance of the good hearted talking cricket, Pinocchio learned his lessons. He bravely plunged into the ocean, and saved his father from a very large fish. Because of his maturity, Pinocchio became a human boy – a gift from the legendary Blue fairy. The lights dimmed, and the play was out. Then, in the blink of an eye, the performers were back on stage, and took a deep bow. The auditorium was soon filled with a thunderous roar of clapping and cheering. The Young People’s Theatre showcased Pinocchio, where four actors played ten characters with energy and fun as the wooden marionette met various characters from the moment of his creation until he became a human child. Krystel Descary played the role of Pinocchio. Using the machines on the inside of the old puppet, she allowed him to walk, and move. Gabriel Desantis-Caron played the role of the fox, and a Jolly man. He used his deep voice to project his authority to the audience. Milva Menard played the role of the cat, Candle Wick, and the Blue Fairy. Using body language, she had already stated the emotion of the story. Claude Tremblay: the man who, in my eyes, added the most humor to the play, like Olaf from Frozen. He played Geppetto, the talking cricket, Mangiafuoco, and a misbehaving boy. In my opinion, Tout a Trac not only well featured the acting part of this show; the supporting team also did a great job building the scene. The play act presented a spotlight on the characters they wanted us to notice. While Pinocchio wished for the blue fairy to turn him into a human boy, the lights moved towards the fox and the cat that tried to steal the last gold coin, and so did my eyes. It also showed the bright oil lamps and brought the thought of “fun” when Pinocchio was in the land of toys. The music made me feel very involved, like a villager just following Pinocchio. It was well composed, and gave the auditorium a touch of holiness. The clothes that the people wore appropriately labeled their class. For instance, the poor Geppetto wore torn and thin layers of clothing. Pinocchio was held by Krystel and presented as an actual wooden puppet. It was full of technology. When Geppetto polished the wood, Pinocchio popped out. This worked because of a spring that sent Pinocchio to burst out after the wood was carved. His nose was extended to a surprisingly long length by using a remote control. After the show, Voice K was pleased to have an interview with most of the actors. 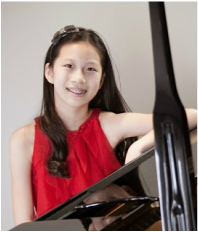 Descary loves playing Pinocchio because it gives her a possibility to experience new things and emotion. “At first, Pinocchio is rude, so I can explore rudeness. Later on, I learn about friendship and love.” She thinks that what makes Pinocchio a lovable character is that he is naïve and naïve is fun because she doesn’t have to see the mean things that the fox and the cat are doing. Descary is a girl, but she was casted to play the role of a young boy because it is difficult for a grown man to sound like a 7 or 8-year-old boy. 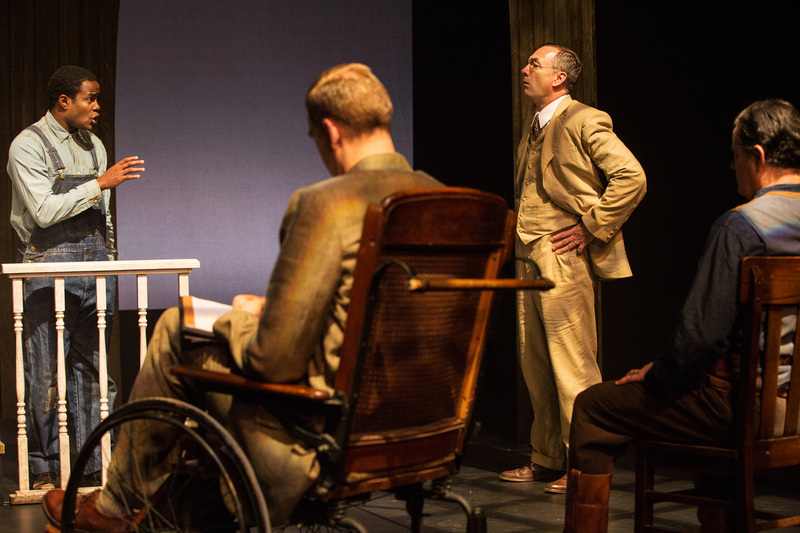 “My favourite scene is the ‘Gospel Scene’,” said Gabriel DeSantis-Caron, the fox in the play. “It’s when the cat and the fox steal the last coin. We finally [got] the last gold coin!” The challenge for DeStantis-Caron is to sound mean and slimy. Bad guys would sound slimy if they want to trick someone in the play, but nobody is really doing that in real life. He also likes his character because it’s rapid tempo during the scenes, and he has to sing, move, and do lots of physical movements all at the same time. Milva Menard enjoyed her parts of the play a lot too. Her favorite character was the cat. “I think the cat is the hardest part of the play. I have three characters: the cat, Candle Wick, and the blue fairy. It’s really the cat that’s my favorite because it is very physical, since I’m wearing a mask,” said Menard. “So I need to put the emotion in my body, and it’s hard.” The cat also just wants to be in the gang with the fox, and really, he’s innocent. Tout a Trac is a company from Montreal, and Pinocchio was brought to the stage in two different languages: French and English. It created a challenge for the actors to rehearse and perform the amazing show. From 1883 to now, the story Pinocchio still brings jaw dropping adventures. Born from a talking piece of wood, the nerve racking Pinocchio earns his heart’s desire from his amazing quests. As Hugo Bélanger says, "We still need Pinocchio because telling the story of a small block of wood dreaming to become human brings hope to a world that is losing its humanity and becoming increasingly dependent on machines." Pinocchio developed his achievement of becoming a human being, an inspiring fact to everyone around us. So there you go, lights, camera, action! From stunning Arabians to elegant Paints; there were so many different breeds of horses we discovered during such a short period of time! On Thursday March 26, 2015, we had the opportunity to go to an exclusive “Behind the scenes” event with other medias professionals. We even got to take a day off from school! This preview took place at Odysseo White Big Top at the Port Lands in Toronto. First, we were shown the huge stage. There were many trees in the background, and the ground was made up of 10 tons of dirt and sand! We got to climb up the stage and see what it was like to be in the show! After that, we even got to explore the backstage! We walked through a tunnel to get to the backstage and the stable. At backstage, we saw an arena where horses could run around freely with the help of a trainer. These horses were referred to as Liberty Horses. Four talented liberty horses were brought to the arena; Gus, Silver, Frosty and Nesma. Elise Verdoncq, a horse whisperer, started off by showing us some of the four-legged stars’ basic tricks, such as lying down or bowing. As part of the media, we were able to interview some trainers. First, we walked into the stables. We went from interviewing experienced horse trainers to fashionable groomers. Emma even got to interview a horse! Some of the main trainers that we interviewed were Amanda Orlowski and Elise Verdoncq. They both taught us that the magic behind being a horse trainer is to be patient, to have mutual respect, and to trust. Simply, it takes time! The Cavalia horse trainers also taught us about the Liberty horses and how they trained them. Cavalia trainers spend a lot of time with these horses, teaching them to listen to their body language and to their voice. Each Liberty horse remembers their position in a line. If they change their order by accident, the trainer easily leads the horse back to its proper spot. Liberty horses are actually trained one by one, then put together into groups all the way up to twelve. “When they [horses] can do everything by themselves, I start to put two horses, then three horses,” says rider Verdoncq, "I am now up to 12 [horses]." On April 8, 2015, we went to see the actual show from 8pm to 10pm. We arrived at the same Big Top. The inside looked totally different from last time we visited, because it was decorated with paintings and souvenirs which you could buy. The show started with quizzes up on a big screen, testing people's knowledge about the horses and trainers. Audience participated and cheered when they got the answers correctly. When the lights dimmed, the audience became silent. The show started off with horses walking across the stage. Soon, the whole stage was filled with horses, trotting around the stage, some with riders riding on them. After a couple minutes, the stage was full of excitement. The horses started running wildly. That was the start of 2015’s Cavalia. There were many acts in this show. However, some of our favorite acts were the Liberty act, Acrobatic acts, Carousel act and the Finale act. The Liberty horses moved around without riders on top of them, but instead with trainers telling them where to go. They sometimes stood in a line, turning around the stage, and sometimes ran around with the guidance of their trainer. The aerialists did multiple acrobatic tricks and flips that made the audience go "ooh" and "ahh". We even heard some low whistles! Some of these aerialists had "jumpy shoes", which were actually called Skyrunners. They had those on display at the souvenir shop too! The Skyrunners made them jump super high, and it sure looked fun to wear! There were even high bars which all the aerialists had to jump or flip over, in addition to the running horses that they had to avoid. The ring act was only one of the acts that left the audience amazed. Descending from the top of the stage, was a slowly spinning carousel. The 18 ton merry-go-around, which took the staff 12 hours to assemble, featured acrobats swinging around the plastic horses that were rising up and down. The Finale act was no doubt, an extraordinary ending! It started off with a single horse at the very top of the mountain, with the lights dimmed, so you could only see a mysterious silhouette of a rider on a horse. When the show ended, everyone was amazed of what they had seen. We didn't want to leave! Odysseo was an amazing experience for us, and we would definitely like to come back someday! Ahhhh... lightning, I am playing Go with lightning! No, that's not what Lightning Go is all about. If fact, it is about an ancient board game called Go and the sound of BEEP, BEEP, BEEP (that’s the chess clock beeping if you haven’t figured it out). On Saturday March 14, my brother and I went to The Golden Key Cultural Center for a Lightning Go Tournament. For people who don't know what Go is, here are some things you might want to know. Go is a two-player strategic board game like chess. The earliest written reference to the game is generally recognized as the Zuo Zhuan. It said something that seemed like a Go event happened in 548 BC. Also, Go is mentioned in the book of XVII of the analects of Confucius. Above that, Go was known as yì. Now, in Chinese, Go is known as Weiqi (Wei-chí). And literally means “encirclement board game.” Go was originally played on a 17×17 board but by the Tang Dynasty, 19×19 board became the standard, up until today. Go was first seen in Zhou Dynasty and has been active since. Later, the coolest form of Go-- Lightning Go -- was made. Lightning Go is just like regular Go, but it is a game rely on speed. A regular Go game in a tournament can take up to 1 hour to a whole day to finish, but in Lightning Go, each player only gets 15 minutes. So the game finishes in 30 minutes. “I always wanted a Lightning Go Tournament to be held, it's the most fun form of Go I ever played. And even though I had to travel one and a half hour to get here,” said Matt Mennie, a Lightning Go tournament participant. Lightning Go is awesome, maybe you can try too. Go is an easy game to start learning, you can start at as young as 3 years old. . How many times have I played lightning Go? Once, that's right, only this once. And I really liked it because I get to think faster for each move. “The most challenging thing about Go is that you really want to play well, you have to spend a lot of time and I did that when I was younger,” said Dix Sandbeck, another lightning go participant who started playing since 1975. I have to say I agree with him because I played go for four years and it's still very challenging even if I practice regularly. At the tournament, three higher level Go players also gave lectures. My Go teacher, Louis Liu, gave a lecture first, and Mingsung Suh, a former Korean Go Institute Student gave a lecture on currently famous Joseki (game opening). Then near the end, James Sedgwick, the president of Canadian Go Association gave a lecture too. The winner of the tournament with five wins is …Mingsung Suh. I personally won three games which I thought it was pretty good for my first time playing lightning Go. After the Lightning Go Tournament, I felt more confident for my tomorrow’s Children’s Go Tournament, where I have to compete with other children to earn a certificate for my next level. “I want to keep on playing Go, because I want to get better and I really enjoy playing it,” says, Liam Hinzman, the Champion of the Children’s Go Tournament. I feel the same about Go and I was happy to be raised to 7K. Now, I have to go back to playing Lightning Go. Ahhhh...I am running out of time! Watch out for the falling peach! James and the Giant Peach rolls into Young People’s Theatre (YPT) from November 24th to January 4th. This performance was inspired by Roald Dahl’s original story. This version has a few plot twists. This performance is focused on building family values, such as kindness, caring, empathy and respect. This play was brought to stage by Allen MacInnis because all of this year’s plays are about fairness. The play is about a boy named James who lost his parents. James is forced to live with his horrible aunts, Aunt Spiker and Sponge. One day, James meets a mysterious man that helps him to make crystals that will brighten his life up. James drops the crystals near a peach tree. Marvelous and peculiar things start happening. - James, the main character. James is shy and always has ideas. James is energetic and active. - Aunt Spiker, James’s horrible aunt. Aunt Spiker is tall and skinny with a tall hairdo. - Aunt Sponge, James’s other horrible aunt. Aunt Sponge is fat and lazy. -The Mysterious old man, whom James meets in his garden, gives James a Bag of magical crocodile tongues that will give him a happy life. The mysterious old man only appears once in the story. - The Ladybug, one of the creatures James found in the magical peach. The ladybug is very lady-like and has nine spots on her back. The ladybug is nice to James all the time. - The Spider, one of the creatures in the peach. The spider is energetic and nice to James. - The Grasshopper, one of the creatures in the peach. The grasshopper loves music and is very gentle with James. - The Centipede, one of the creatures in the peach. The centipede doesn’t like James at first but realizes James could be his friend. - The Earthworm, one of the creatures in the peach. The earthworm is very “cute” and doesn’t really talk to James at first but finds his way to being in James’ family. What would a play be without costumes!? The costumes used in this play looked splendid! As a journalist, I got to interview Milena Radeva, who makes props for YPT. Milena enjoys using different materials and exploring what different materials can be used for. Milena thinks helping out with the costumes can be stressful at times because she only has a short amount of time to make the costumes. The lighting made this play look amazing! The most important part of lighting in this play was the shadows. I interviewed the lighting designer, Jason Hand. Jason goes to rehearsals and decides the lighting. Jason loves to play make-believe with shadows. The most interesting shadow in the play to me was the scene of James’ mother and father’s accident. Their shadows looked realistic and clear. The director of James and the Giant Peach is Sue Miner. Sue thinks being the director of the play is fun but stressful at the same time. “It’s stressful because a lot of decisions are up to me,” said Sue. I think Sue did a wonderful job directing the play. The main character of this play was James of course who is acted by Alessendro Costatini. “I’ve been acting for ten years so far,” said Alessendro. He really liked being on stage when he was little. Alessendro became inspired to act with a love of stage. Alessendro is trying to convey courage through his performance in this show as that is what he believes this play is about. Dale Miller, who acted the centipede, told me, “The most difficult part for me is memorizing lines.” Dale was inspired to act by his love of stage and singing. Dale thinks this play is about family. The earthworm, in my opinion, is the cutest character in the whole play! “I did my first musical when I was 15,” said Jacob. Having a love for music inspired Jacob to act. Like Dale for Centipede, Jacob thinks that memorizing lines is the most difficult part. Jacob thinks this play is about discovering where you belong. I was pretty surprised to see Jenny, the actress I interviewed before who played the title character in the Annie musical at YPT last year. “I love to hear James singing,” said Jenny. Jenny thinks the play was all about being part of a family. As the play ended, I felt sad because it was time to leave. I thought the show was amazing and fun. I hope to visit YPT again!!!! 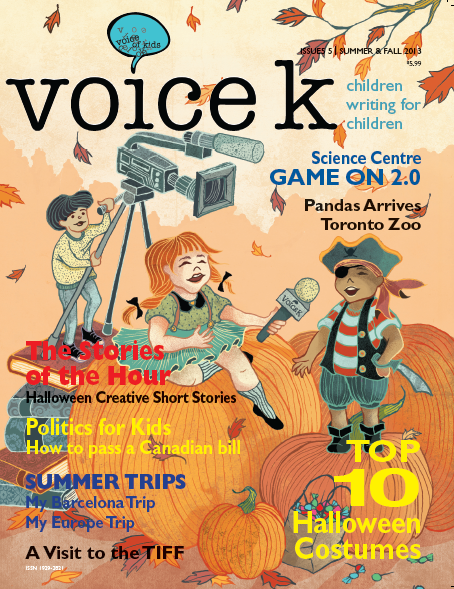 Recently, Voice K had the opportunity to tell our longest serving mayor, Hazel McCallion, about how we adored her. Three journalists from Voice K each made an official speech to her in person! Our mayor is an outstanding mayor. I’ve seen her in many community events. Once I saw her at a StreetFest during my birthday. I also saw her at a Christmas parade. I never miss the part where she comes in! I’ve seen her at the City Hall during the New Year when my choir sang there. Recently, I saw her at the Terry Fox Run. Our mayor is honorable. She takes part in lots of community events and makes a lot of effort. No matter whom our next mayor is, our Mississauga has already become strong. Hazel McCallion used a lot of determination and hard work for Mississauga to be the best place it can be. Hazel McCallion is our mayor that we will always remember. 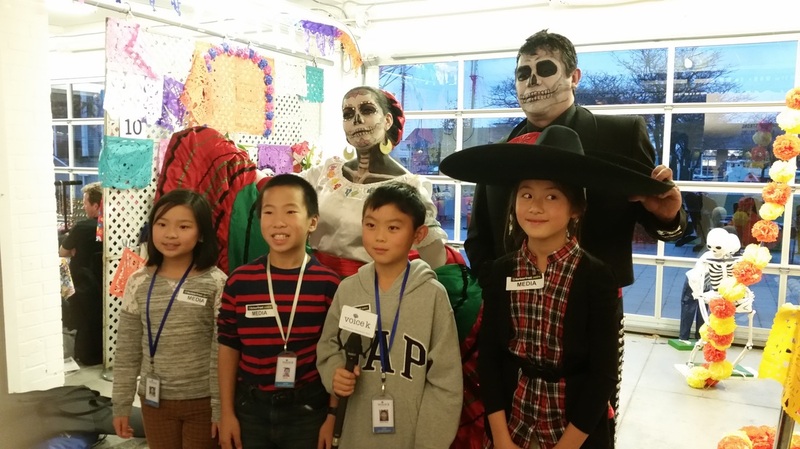 On November 9, 2014, Voice K journalists went to the Day of the Dead Festival at Toronto Harbourfront Center. Colourful lights lit up the rooms. The halls were filled with beautiful Mexican paper cut-out decorations and stunning flower arrangements. Mexican music was heard almost everywhere. This festival looked like a memory from Mexican past. When we got there, we went downstairs into a room full of information on the Day of the Dead. We went to the back where we started to do some paper cutting, just like the ones that were hanging on the ceiling. When we got to the theatre for the band performance, it was already very cramped. A couple minutes later, the show started and the audience quieted down. A man walked onto the stage and gave a mini-speech. He talked about the birth of the festival and he introduced the band ─ which was all female ─ that was called “Mariachi Flor de Toloache”. The band members explained that “Flor de Toloache" is the name of a flower in Mexico that they put in love potions. The show included various songs from the people of Mexico and also Latin America. They have slow, fast, high- and low-pitched songs. They sing many famous songs like Calaca and Guadalajara. All band members wore skull makeup on half of their face. They were also dressed in beautiful band costumes. To us, we didn’t see a band with costumes and makeup. When they were playing slow music, we saw a musical river with beautiful cherry blossom trees all over it. When they were playing fast music, we saw an empty desert with a rampaging horse dancing in the distance. The audience cheered for the Mariachi Band on stage while they were singing a wonderful tune and clapped to the beat while others danced or sang. That is the Mariachi Flor de Toloache. They are the first ever Mariachi band that are all women. In 2008, Mireya Ramos found the Mariachi band. The Mariachi band was originally from New York, but the members are from Indiana, United States, Australia, Dominican Republic, Mexico and even Canada! What you can explore are celebrations from Mexico and other areas of Latin America. 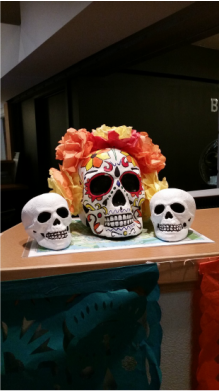 Day of the dead (Dia de los Muertos) is the time of the year when people celebrate and be happy for the people from the past. This celebration was born before Christianity was invented. “All the activities from the festival are about legacy, celebrating the past and passing onto the next generation,” said Jaffer. Crafts, music, and fun! I couldn’t decide which was best. From the craft section, there was a great artist, Steve Loretta, who made attractive skull crafts. The most interesting skull was a sugar skull completely covered in icing leaves which was really breath-taking since the leaves looked real. There were paper skulls, sugar skulls, full skeletons, and skull decorations. The biggest question in my head was how he created so many decorations for the celebration and did not run out of ideas. “I was inspired from my heart to make these creations and that is just a thing I like to do,” Loretta said. He even made a sugar skull kit with which to decorate your own sugar skull with icing. The decorations came with eye catching colours and irresistible style. This is a Mexican celebration to respect the dead. Next time don’t forget to have fun with some awesome Day of the Dead crafts! On Tuesday, November 18, 2014, Voice K went to the media opening of the Ontario Science Center's newest exhibit, "Brain – The Inside Story." The experience was so educational, fun, and even weird! The first thing we saw when we walked into the doors of the Brain exhibition was a large amount of tangled wires covering the ceiling. At first I felt very confused, but then I read a sign and suddenly I understood. This is what it looks like in a brain. As I moved on, I learned more and more fascinating facts. Did you know that if you have shorter memory it is because you don’t get enough sleep? Also, did you know that there are about 100 billion neurons present in the human brain? That’s about 15 times the total human population on earth! There were activities and games at every turn. There was a stacking game, a tracing game, a language game, a map route game, and lots more! The tracing game had you trace a shape while looking at your actions in a mirror, so you can only see what you are doing through the mirror. 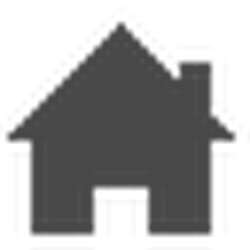 There was a Beginner Shape, which was a triangle. The Advanced Shape was a star. Warning: this activity is easier said than done, but it gets easier over time. It was an example of How-to Memory. The stacking game is a simplified version of the Towers of Hanoi, where two people can compete against each other. There was also a screen that showed you what happens in your brain when you do things. For example, it showed what happens in your brain when you steal a cookie from mom, when you're happy, or when you’re hungry. There were plenty of strange facts as well. One of the games taught you that things can be easier to memorize when they are in groups that make sense. Plus, there were facts about memory. There was one guy who memorized 2254 digits of π! Also, we learned that descriptive words can play tricks on your mind. There was also one activity that told you to read two columns that had colored words in them. Column A had words like black, red, and white printed in the color of the words. Column B had the same words, but printed in different colors. Then you had to use the clock above to time someone not to read the words, but to say the color they are printed in. You will notice that Column B takes longer. We interviewed two guests at the exhibition, Alicia Hilderley and Andrew Barr. Alicia is a Ph.D. student at the University of Toronto. She works part-time for the Holland-Bloorview Kids Rehabilitation Hospital, one of the organizers for the event. She gets to work with lots of kids and play interactive games with them. Alicia claims to like everything about the exhibit, but feels that having more games, which is already her favorite part, would make the place even more attractive. Her number-one activity is "Stacking Cubes." Though Alicia is an expert on brains, she still learned lots of new and interesting things at the exhibition. "It's very inspiring," Alicia concluded. Andrew is also learning about the brain at school – its function, makeup, and evolution. He said that his experience at the science center would help him indefinitely during his studies. Andrew found the exhibit very fun and exciting because it was his first time at the facility in many years and he was able to gain a lot of knowledge from the trip. Above all, Andrew liked the languages activity, as he felt that it revealed the substantial differences between some of the languages that are spoken around the world. Elaine Bidiss is a scientist at the Bloorview Research Institute and a Professor at the University of Toronto’s Institute of Biomaterials and Biomedical Engineering. She was developing a new way to let kids have fun while waiting in the waiting room of Holland Bloorview Kids Rehabilitation Hospital. She didn't want kids to be bored, but, in an even worse scenario, anxious. Anxiety could result in resistance to treatment, worry, and fighting to not go back to the rehab center. Boredom is just a minor problem, but anxiety proves to be a major problem. They didn't want kids to have a bad memory of the place. The problem was, they couldn't use toys that involved touching surfaces that everyone touches, because contagious viruses could spread very easily just at a touch. That meant iPads, computers, dolls, hand-activated toys were out of the question. What about bubble machines? That was a good question. It only involved looking at something. However, it’s still no good ─ that interested parents for about 5 minutes, and kids for about 5 seconds. The hospital tried so many things, and after years of experimenting, they came up with a great toy that involved the art of waiting. There was a colourful carpet on the floor and by standing on the squares, floor sensors under the carpet send messages to a big screen. The longer you stand there, the prettier the pictures and sounds will become. Now, parents and kids alike can enjoy growing a garden together! We also wanted to know why she chose to study the brain. She thought that the brain was a sort of magical thing, and she thought that it was important to know how your brain works, how you learn, how you think. “We want to make sure that kids with disabilities can do things all kids like to do and have fun doing it, so we design technology that makes it easier for kids to do those sorts of things,” Dr. Bidiss said. We asked a few questions on the brain itself, and learned that playing piano is good for the brain. If you want to improve someone’s brain, it takes practice and willingness. When we asked her why she thinks the brain is located in our heads, she laughed and said she thinks it makes it harder to be damaged, compared to being located in the foot or hand. The lights, the music, and the magic─everything is on fire when you’re at the Cavalcade of Lights! From carols to dancing, instruments to fireworks, there’s absolutely nothing you won’t enjoy at this incredible event. On Saturday, November 29, 2014, the 48th year of this festival took place at the Nathan Phillips Square in Toronto to celebrate Christmas. Before the show, we interviewed the Programming Supervisor at Toronto Cultural Events, Kerri McDonald. She says that the most challenging part of her job is last minute changes. “We’ve been trained to just roll with that, to just go like, ‘Oh well, too bad, so sad’ and let’s get on with Plan B.” McDonald says. McDonald and her team began preparing for this event in February, and have been working hard on it since, especially in the summer and fall. The 60 foot tall Christmas tree also took a long time to set up, so that it could wow the audience with its 12,000 bright lights. “We just thought it would be fun to do something a little different, a little edgier,” she says. At approximately 7 o’clock, it was the moment that everyone was waiting for! The show had finally started and thousands of people gathered around to watch the performance come to life. Everyone was jittery with excitement. The Drumline started off the show with some superb drumming! Next, the a cappella group Retrocity sang some Christmas carols. A cappella is singing without any instruments, using only voices to create music. 5, 4, 3, 2, 1! Finally, the enormous Christmas tree was lit up! This was the official lighting of Toronto’s Christmas tree. Thousands of lights shone brightly on the tall tree. Never had we ever heard such loud and enthusiastic cheering. The beautiful decoration, the shining lights, it was absolutely amazing. The massive tree made everyone speechless. We could really tell that the staff put a lot of work and effort into it. After the lighting of the tree, there were performances by various hip hop artists and dancing by the Collective Elite Dancers. The show featured Kardinal Offishall, Kellylee Evans, and Maestro Fresh Wes singing some Christmas songs with a twist of hip hop. At around 8:20 pm, the fireworks went off. It was a brilliant display of colorful fireworks. There was even fire coming from the top of a building! The audience was awed by this spectacular. There was an explosion of many fireworks, all at once; the magic really caught everyone’s attention. In our opinion, the fireworks were one of the best parts of the entire show! To finish off the show, the Cavalcade of Lights featured Shad, an up and coming hip hop artist. This event was truly outstanding! It’s impossible to describe in words how exciting this experience was. It was a pleasure to be able to come, and we are definitely returning next year.